In the past few years Ken Terpstra has taken time to press the reset button on his life, and part of that includes taking a more active role in his community. Ken bikes to New Door’s San Francisco location regularly, tutoring youth who are participating in the education program and working to pass their high school equivalency tests. He started tutoring with New Door three and half years ago when he found that he had some extra time in his life. 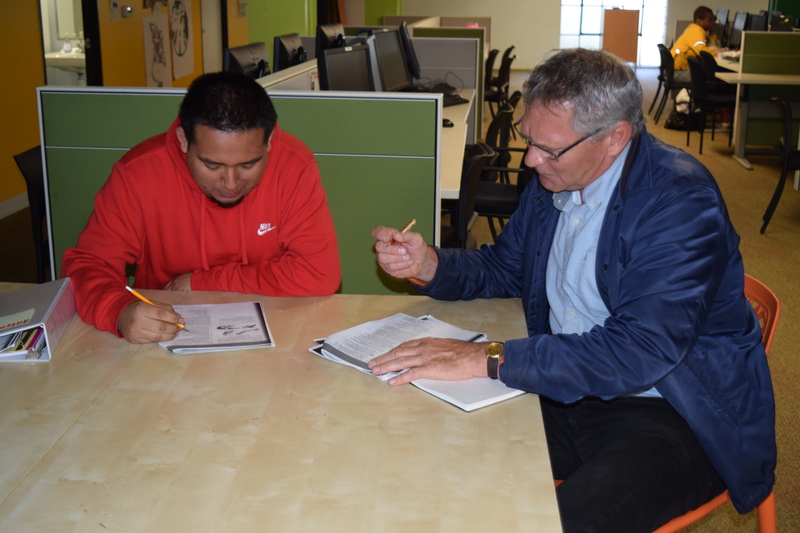 Ken, who lives in San Francisco, felt compelled to use this time to give back- since then, he’s tutored more than nine youth and seven have gotten their GED or HiSET. Ken highlights the importance of the New Door’s down to earth atmosphere, citing that everyone “leaves [their] ego at the door,” making it a supportive learning environment. On his first day as a tutor he was unsure about what he was getting himself into, but immediately felt the positivity in the air. He also notes that the passion and talent of the education program staff set up the students for success- in 2017, 85% of all students who started testing earned their GED or HiSET. Ken often finds himself talking about New Door to his friends and family, who all mention that he the lights up when he talks about his experiences. “I dare say my time at New Door is more meaningful than any other activities I am involved with on a day to day basis,” he says. Although Ken has a background in math and science, he tutors all subjects. History is one of his favorites; he’s fascinated by how past events impact the present. Ken says he feels incredibly grateful that he gets to share his passion for learning with others. Each student has their own story and their own breakthroughs, and Ken knows that people learn in different ways and at different speeds. He relates his method of tutoring to learning a new piece on the piano: through practice and repetition comes fluidity, success and understanding. Ken often thinks back to his own schooling and remembers how difficult studying can be, often repeating concepts over and over, until finally arriving at success. He notes that not all days at New Door are breakthroughs – at least in the conventional sense. Years later, Ken is still inspired, and continues to make a change at New Door one person and one challenge at a time.